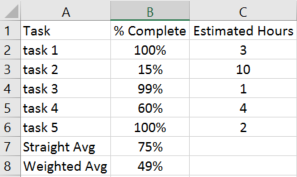 In excel 2007 and forward there is a function called SUMPRODUCT(), which allows us to skip the step of calculating the weighted product for each row at the row level. As its name suggests, this function multiplies corresponding components in given arrays, and returns the sum of those products. 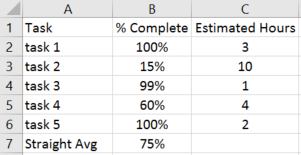 In my example I supply two arrays of data, but the function will accept more in case you wanted to use more than one column as a weight. As you can see, this simplifies the calculation into a single cell and avoids odd features like array formulas, which I purposely omitted in this post. For more information and examples on the sumproduct() function please visit the microsoft link here.